" We facilitate them by giving one shelf display and two iron racks for each merchants"
South Jakarta Small Medium Enterprises Cooperative and Trade (KUKMP) Sub-dept. provides trading facilities for 29 coached merchants. South Jakarta KUKMP Sub-dept. Head, Shita Damayanti said, today, trading facilities are provided to them from four sub-districts. Five merchants are from Mampang Prapatan Sub-district, 15 merchants from Pasar Minggu, three merchants from Pesanggrahan, and six merchants from Setiabudi Sub-district. "We facilitate them by giving one shelf display and two iron racks for each merchants," she conveyed, Monday (12/17). She explained, trading facilities will be also provided gradually to 95 coached merchants through APBD 2019. 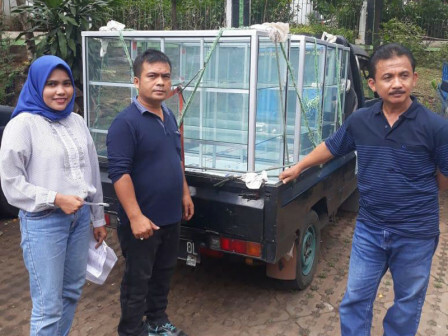 "Previously, we had submitted shelf display and iron racks to 15 merchants in Tebet Sub-district and six merchants in Pancoran Sub-district," she explained. She hopes this facility could increase merchant's incomes. "Store will be cleaner and neater. We want their income to increase for a prosperous life," she stated.